Cheap MMA shorts can be hard to come by if you don’t know where to start looking. For a lot of retailers, cheap MMA shorts can also mean low quality MMA shorts but there are a few places where you can pick up high quality MMA training shorts at a fraction of the cost. In this article we’re rounding up the best places to buy cheap MMA shorts, showing you what to look for when choosing your next pair of fight shorts without having to sacrifice quality for cost. Flexibility – a lot of shorts are made of either four way stretch or two way stretch fabric, some with slits along the side of the legs to ensure maximum leg mobility. Fast Drying – Working up a sweat, you’re going to need a pair of shorts that have good moisture control so opt for a polyester style fabric, preferably with some form of microbial property to help you stay dry and prevent chafing. Secure and Comfortable Fit – Whether it’s rolling, grappling, or kicking, mixed martial arts involves a range of high impact movement so you’re going to need a pair of training shorts that will stay in place securely but still be comfortable. A good pair of fight shorts will combine a drawstring and Velcro closure, though some will also have elasticated waist bands. Safety – MMA fighters should avoid shorts that have any kind of metal fastenings or loose flapping parts for their own safety and the safety of their opponents. For safety reasons, a lot of fighters also prefer shorts without external pockets. So, now we know what to look for when buying the right pair of MMA shorts, let’s take a look at the best places online to buy cheap MMA shorts, keeping all of these quality factors in mind while checking out the best discounts and prices. Jaco Clothing is your place to go if you’re looking for a wide selection of hybrid training gear with some really good discounts. Jaco stocks their own brand of MMA shorts for men as well as women’s fight gear. Jaco’s popular hybrid fight shorts have a 4 way stretch, sweat wicking fabric and also feature an innovative waist tightening system that uses a drawstring with a back compression panel to ensure a tight and secure waist with a relaxed and comfortable fit around the leg. For the girls, Jaco offers two main styles of MMA shorts: a shorter compression style that can be worn under looser shorts or on their own, as well as a longer style of capris tights. Both styles are made of durable and flexible, moisture control fabric. The Jaco store does have regular clearance center with impressive discounts on some items, though cheap MMA shorts aren’t always on sale so for shorts specifically, you’ll have to keep an eye on their clearance range. At regular price, you can pick up a pair of men’s fight shorts for $54.99, and only $24.99 for the women’s compression shorts which already makes them both cheaper than a lot of other brands. Pros– High quality hybrid fight gear with styles for both men and women, good value even at full price. MMA Outlet stock an impressive array of men’s MMA gear and youth MMA shorts, but MMA Outlet doesn’t stock MMA shorts for women. They stock a good range of popular brands including Venum, Combat, Hayabusa, Clinch Gear, and Contract Killer, and have one of the best ranges of clearance items around. MMA Outlet has great discounts on fight shorts so when you’re looking for cheap MMA shorts, you’ll be sure to find something worth a look. 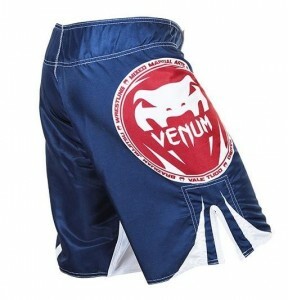 At the time of writing, they’re offering impressive discounts on a range of top end MMA fight shorts, including Venum and Clinch and also giving away free shipping on some orders. looser fitting legs and Velcro drawstring waists – though they do stock a range of compression shorts. 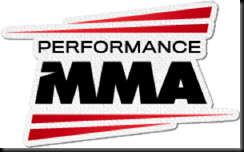 Performance MMA has a well stocked clearance range but cheap MMA shorts are sometimes few and far between, with most of their specials on MMA shirts, MMA gloves and other fight gear. There are a few pairs of discounted shorts. 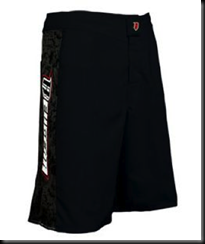 At the time of writing, Performance MMA has 50% off some styles of Tapout brand board shorts, and are selling Jaco brand fight shorts with a 40% discount. Pros – great range of brands and sizes, when shorts are on special, good savings. Kombat Gear is your place to go for custom MMA shorts. Designing your own custom fight shorts using Kombat Gear’s innovative online software is super easy. 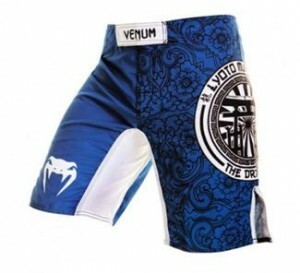 Just pick the type of shorts you’re after, select your colors and styles, choose from a selection of cool graphics of add your own custom text or stick to a blank MMA shorts design and you’re good to go. Kombat Gear offers custom made Muay Thai shorts as well as boxing trunks and K1 trunks, all with the same customizing options. If you’re not looking to design your own fight shorts, Kombat Gear also sells their own range of ready made MMA shorts and Muay Thai gear. Designing your own custom MMA shorts isn’t as expensive as you might think, with a custom pair of Muay Thai shorts going for around $40. Kombat Gear is also currently offering a free upgrade to premium shipping services on all orders. RevGear stock their own brand of MMA gear as well as a range of Triumph and Bad Boy branded gear. RevGear have a great range of different styles of MMA shorts for men as well as MMA shorts for women and kid’s MMA shorts. The RevGear brand Spartan Pro fight shorts (RRP $49.99) are one of the most popular pair of MMA shorts going around. They have a super light two way stretch polyester fabric with antimicrobial agents, tough reinforced stitching and a 5” side slit, and come in a range of colors and designs. It’s not often you’ll see these exact shorts on sale, but RevGear does have a good range of regularly rotating discounts on shorts, with some gear at wholesale prices. At the time of writing, RevGear have good deals on cheap Krav Maga pants, offering around 35% off the full price. RevGear also sells cheap Muay Thai shorts for men and women, even when they’re not on sale for only $29.99. Whatever your MMA fighting style, whatever MMA training shorts you’re after, these stores will have something to offer you without breaking your budget. If you’re after cheap MMA shorts you can use for a variety of sports and hybrid training, head to Jaco for both men’s and women’s gear. 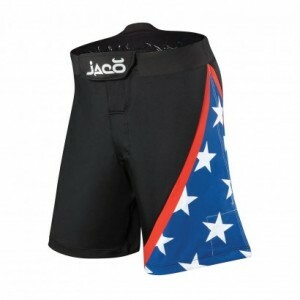 For high quality men’s MMA shorts, Jaco is also a great choice. Performance MMA is the best stop for a variety of cheap MMA gear, and you’ll even find some discounts on Jaco shorts that may not be on sale in Jaco’s own site. MMA Overload is the best place to find cheap MMA shorts from a range of popular brands as well as good shipping discounts. There’s no need to spend a lot of money on a good pair of MMA shorts. With plenty of options available in a range of styles and sizes, you’ll be able to pick up a high quality pair of cheap MMA shorts from any of these outlets. Previous post: Cheap MMA Gear – We Review the Best Stores!